The course was designed by Joe Ward. It first opened for play in 1962. The course was built in an area that is arid, windy, isolated and subject to temperature extremes. The course was built as an amenity part of a large land promotion scheme that many today believe was a land scheme similar to swamp land sales in Florida in the 50s. This was the Oregon equivilent. In 1960, over 72,000 acres of Christmas Lake Valley land to the Penn Phillips Company. 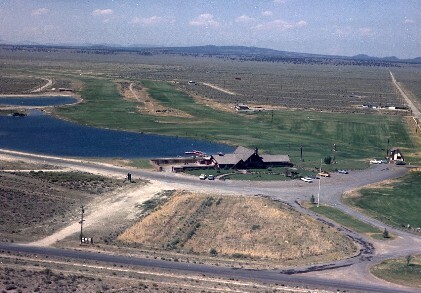 The California-based real-estate company constructed a $100,000 A-framed lodge, as well as the nine-hole Christmas valley Golf Course, an airstrip, and a small artificial lake on its newly acquired land. It also engaged in an aggressive and highly successful advertising campaign, selling parcels and lots to retirees and would-be farmers from the Los Angeles area. Within the first three months of advertising, the Phillips Company sold off nearly 100 percent of its holdings, but buyers were slow to arrive, and slower to stay. Despite thousands of parcel sales, the area has never exceeded a population of 1,000.